, an Italian mathematician, was born at Verona, Nov. 4, 1721, and was educated at Padua, principally in jurisprudence, in which faculty he took his doctor’s degree, but he did not confine himself to that science. The knowledge which he acquired was so general, that upon whatever subject the conversation happened to turn, he delivered his sentiments upon it as if it had formed the | only object of his study. On his return from the university, he entered on the possession of a considerable fortune, and determined to devote himself entirely to literary pursuits. The Hebrew, Greek, Latin, and Italian languages occupied much of his time, his object being to understand accurately the two first, and to be able to write and speak the two last with -propriety and elegance. He also learned French, Spanish, and English, the last particularly, for he was eager to peruse the best English writers, and was enabled to enter into their spirit. Ethics, metaphysics, divinity, and history, also shared much of his attention, and he displayed considerable taste in the fine arts, music, painting, and architecture. Nor did he neglect the study of antiquities, but made himself familiarly acquainted with coins, gems, medals, engravings, &c. Scarce any monumental inscriptions were engraved at Verona which he had not either composed or corrected. With the antiquities of his own country he was so intimately acquainted, that every person of eminence, who visited Verona, took care to have him in their company when they examined the curiosities of the city. But these pursuits he considered merely as amusements; mathematics and the belles lettres were his serious studies. These studies are in general thought incompatible; but Torelli was one of the few who could combine the gravity of the mathematician with the amenity of the muses and graces. Of his progress in mathematics we have a sufficient proof in his edition of the collected works of Archimedes, printed at Oxford in 1792, folio, Greek and Latin. The preparation of this work had been the labour of most part of his life. 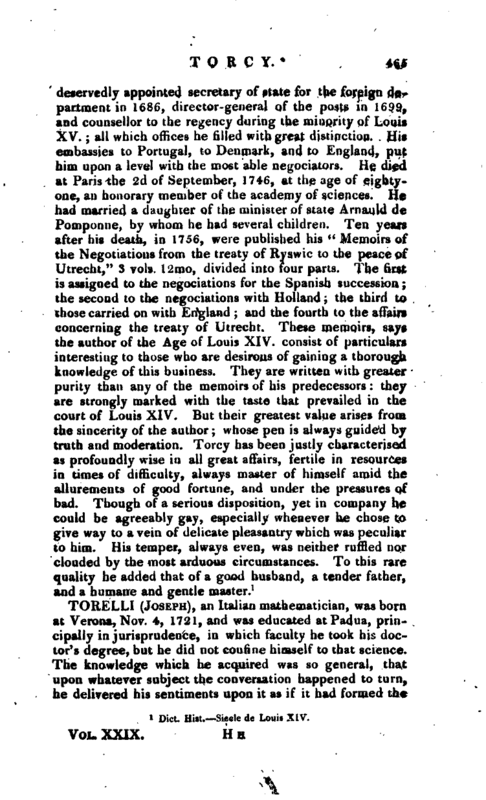 Having been completely ready for publication, and even the diagrams cut which were to accompany the demonstration, the manuscript was disposed of after his death to the curators of the Clarendon press, by whose order it was printed under the immediate care of Dr. Robertson, the present very learned professor of astronomy. It seems to be the general opinion that there have been few persons in any country, or in any period of time, who were better qualified, than Torelli, for preparing a correct edition of Archimedes. 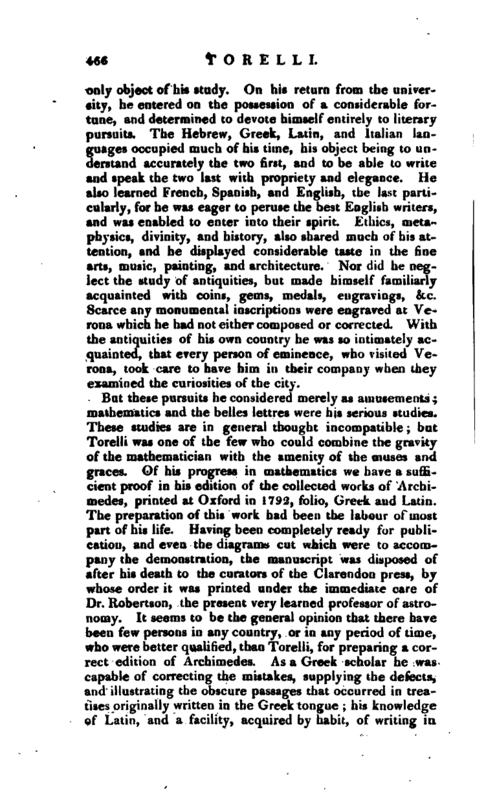 As a Greek scholar he was capable of correcting the mistakes, supplying the defects, and illustrating the obscure passages that occurred in treatises originally written in the Greek tongue; his knowledge of Latin, and a facility, acquired by habit, of writing in | this language, rendered him a fit person to translate the Greek into pure and correct Latin, and his comprehensive acquaintance with mathematics and philosophy qualified him for conducting the whole with judgment and accuracy. Torelli wrote the Italian language with the classic elegance of the fourteenth and fifteenth centuries, as appears by his different works in that language, both in prose and verse. He translated the whole of jtsop’s fables into Latin, and Theocritus, the epithalamium of Catullus, and the comedy of Plautus, called “Pseudolus,” into Italian verse. The first two books of the Æneid were also translated by him with great exactness, and much in the style of the original. 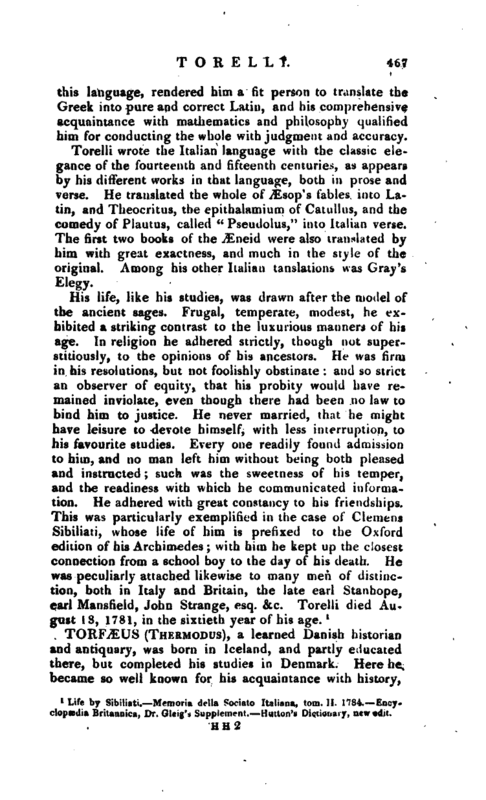 Among his other Italian tanslations was Gray’s Elegy. 1 Life by Sibiliati. Memoria della Sociato Italians, torn. II. 1784. Encyclopaedia Britaunica, Dr. Gleig’s Supplement. HuUou’s Dictionary, new dit.